Skull with cut away and hinged sections. In a glass and wood display case. 12.5″h. 9″w. Isn’t Reginald rad? I just won him in an auction about 10 minutes ago. I know some folks think it’s weird/creepy/macabre to own, like, a human skull. But think about it: we all have one. And, once on display, skulls live on as art. This specimen is hand-painted and was used to teach medical students. The cranial cap is completely removable. The lower half is bifurcated lengthwise and the halves split apart. There are other sweet cutaway sections held together with springs, hooks, pins, and hinges. Inside, there is more painting detailing the major arteries and veins. This is the 5th skull I’ve temporarily owned long enough to sell. I’d gladly keep & display them all, but, believe it or not, they are highly sought after items. Reginald’s great condition, painting, movable parts, and display case means he’ll easily double my money (and possibly triple it.) Reginald is an investment. He’ll go up Ebay this coming Monday or Tuesday. But also cool as hell. OH NO! Not only has it been 500 years since I posted (actually only like 2 weeks), but I’m also out of tat appointments for awhile. 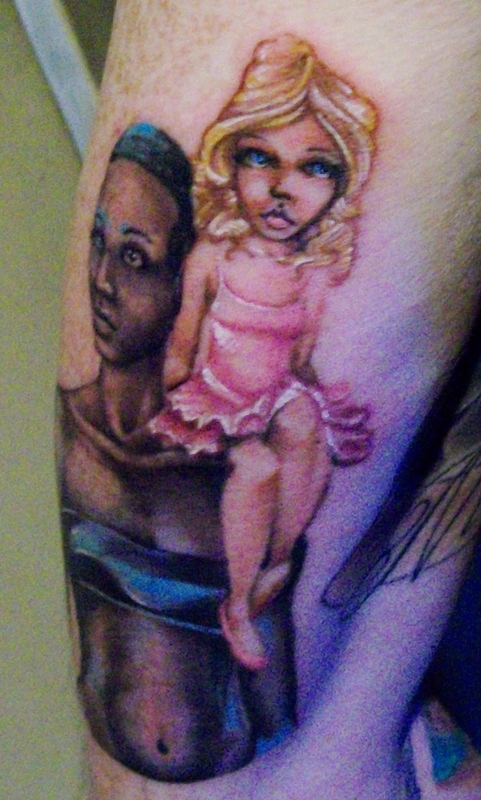 My artist is booked forever in advance, but we’re squeezing more ink in when he gets cancelled appointments. 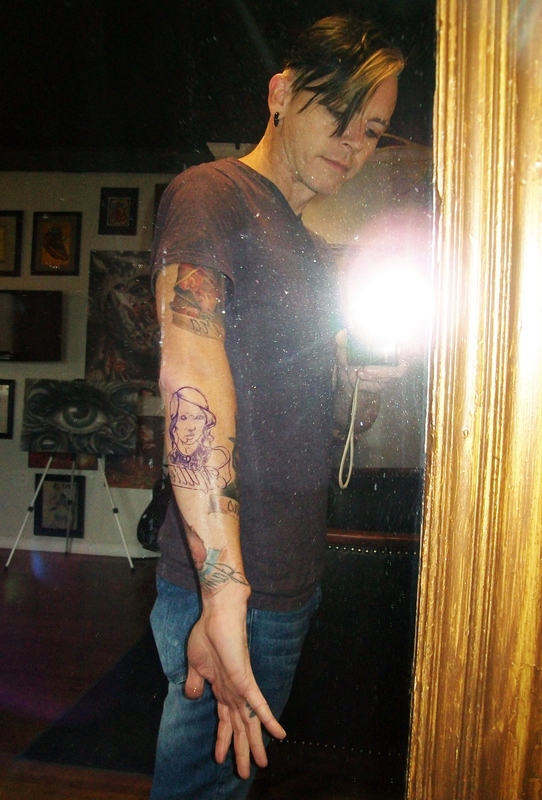 Hopefully the phreak-sleeve will be completed & healed by summer? We’ll see if the planets align to make that happen. In the meantime, I’m in the thick of hot and heavy edits on the manuscript. Challenging, fun, brain-juggly (totally a word). At this point, the hard work feels totally worth it. But then there’s the variable of feedback once the edits are submitted. Once again, doing my part, but I guess I have to leave the outcome to celestial alignment, literary luck fairies, and the like. 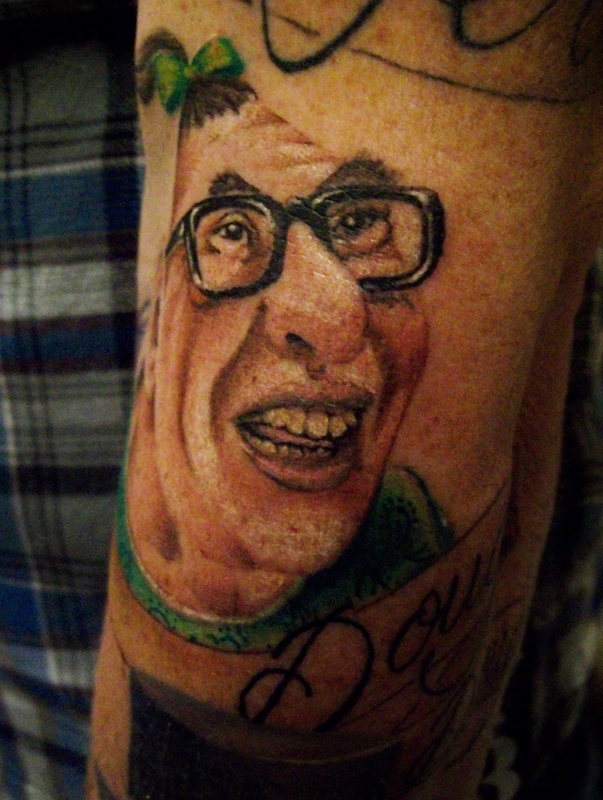 Douggie! While a genius, Douggie has been labeled and mistreated simply because of his smarts. No worries, Douggie. I immortalized your Phreak Show persona for you. You know how shallow some folks are. Now, they’ll never guess you’re intelligent as long as you keep quiet. 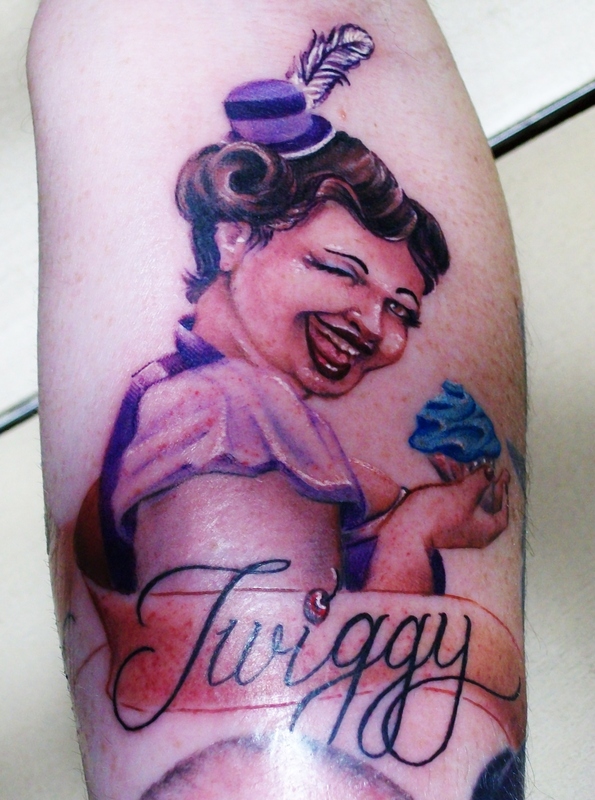 It took two weeks to get her image just right, but Twiggy [I feel] is gorgeous. I had a very strong concept in my mind. And, for some reason, I feel like I owe Twiggy a perfect execution of that vision. Don’t ask me why I feel so possessive of her. I just do, and can’t exactly explain it. 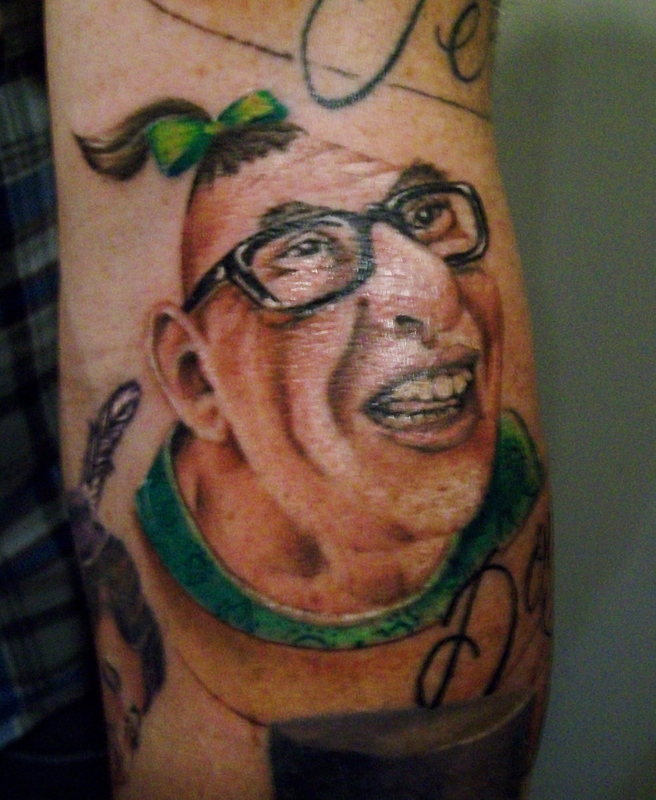 Right now, she and Jamie are battling for the top spot of Phavorite Phreak Tattoo. Until now, the phreaks have been kind of scattered, spread in a pre-ordained layout to make room for them all. 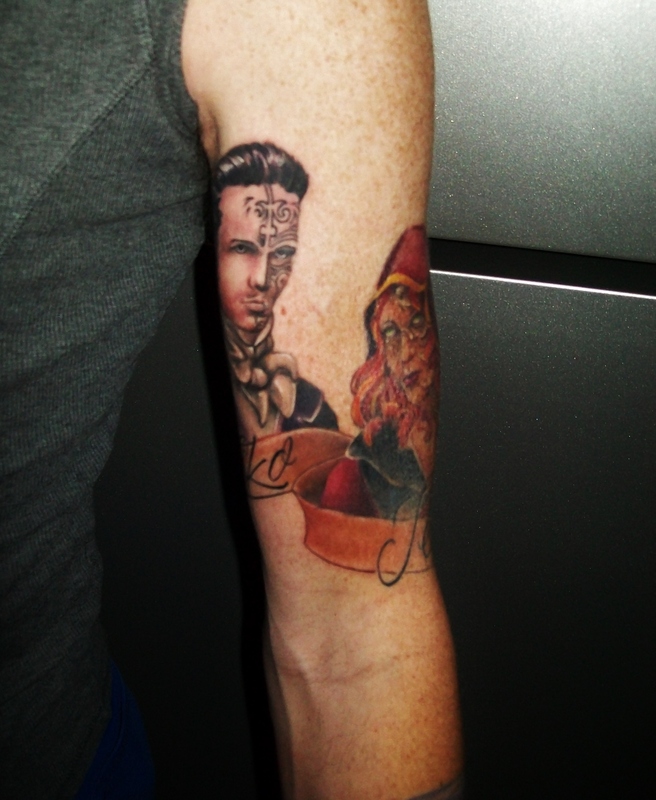 With the proximity of the images coming together, it’s actually starting to feel like the beginnings of a sleeve. Over the next couple weeks, the individuals will continue to interact with the ones who have come before them. The gaps will fill, the images will play off one another. Wouldn’t say I’m an addict, but I’m definitely a fan of immortalizing ideas & images worth immortalizing. Twiggy was, as usual, sitting on her bed shoving food in her mouth. “How’d it go?” she asked. You eat all the time. I caught a whiff of pungent stank. Was it Twiggy’s rank chips? Oh gods. No. It was my skanky armpits, the oniony b.o. rejuvenated by the sweat and the rain. I really needed to slough off the week-old funk clinging to my crevices. I had my backpack, but my clothes and hygiene bag were still in my car. Miles away. Out of gas. But, damn, I needed to get clean. A saying I’d once heard—maybe at school, or online—flashed in my head. All things being equal, fat people use more soap. “Do you have any soap?” I asked my hefty host. “The rain. I’m so in need of a shower. You don’t even want to know,” I said. Confession: I DO know why Twiggy’s image is even more important to me than the MC Tera’s or the love interest Niko’s. Many readers have identified with Twiggy’s struggle. I feel an obligation to them to get her right. Maybe obligation isn’t the right word. How about, I have the desire to do right by Twiggy and—by extension—to those who identify with her. We had a little plot twist in the tattoo session today. 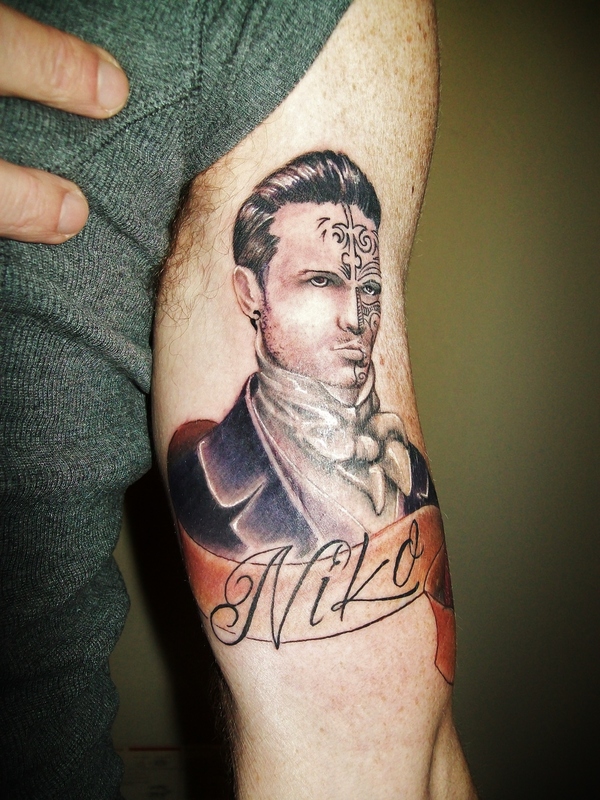 I give Joe pretty free reign on creating the tat images. I start him off with source images & we discuss their physical & emotional characteristics & roles in the story. 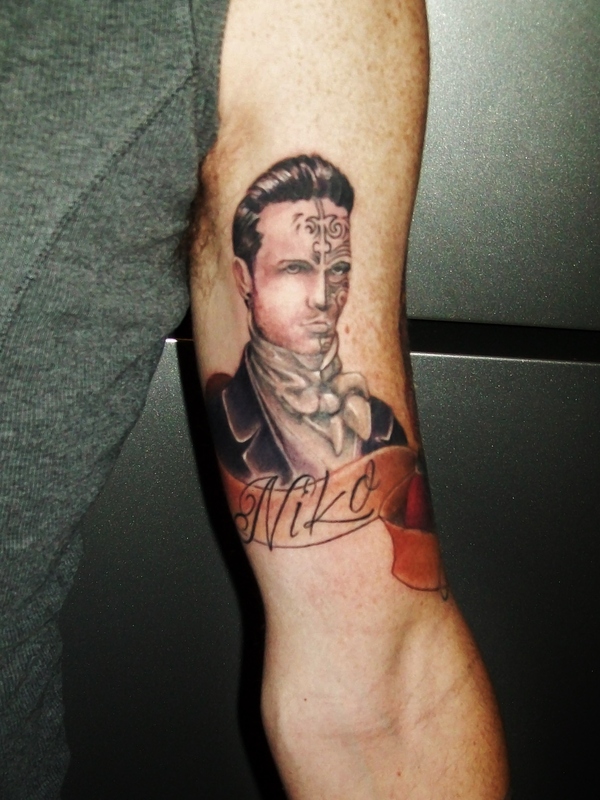 He then infuses his own style and artistry into the final tat. 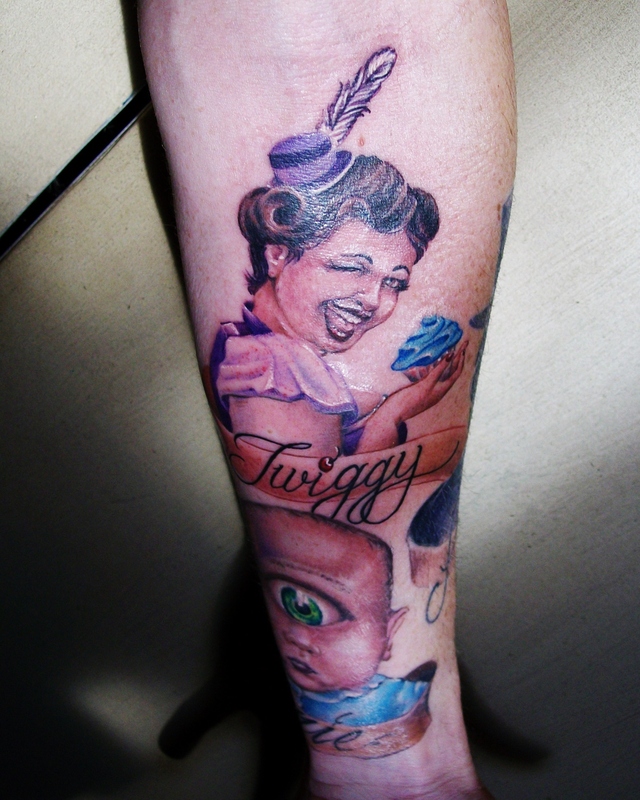 Today’s plan was to immortalize Twiggy. But I have a VERY specific image in my melon of what I want her to look like. Thus, we’re taking more time to tweak her and get her just right. So Millie moved up in the queue. 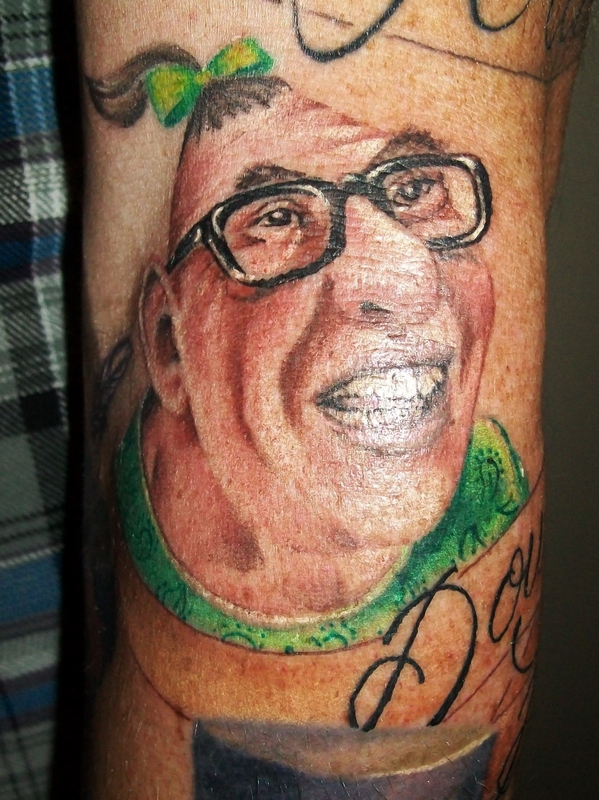 I have been challenging Joe with my tat requests. Jamie was his first one-eyed baby portrait. 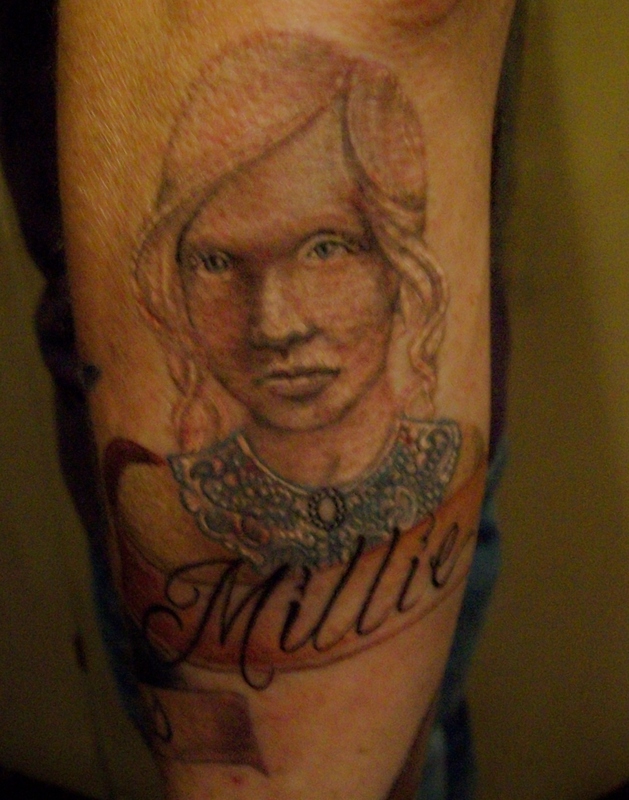 Millie was his first albino portrait. Obviously, she can’t be just pure white, so he had to work in slightly darker tones of pale peach and pale gray-blue. And white eyelashes? Also a challenge. Some skin doesn’t take white ink very well, but mine rather enjoys and holds on to it. Even still, from a practical perspective for the artist, tinting/shading with mainly white is difficult. [SQUEAMISH ALERT] The blood mixes with the white, tinting it pink. 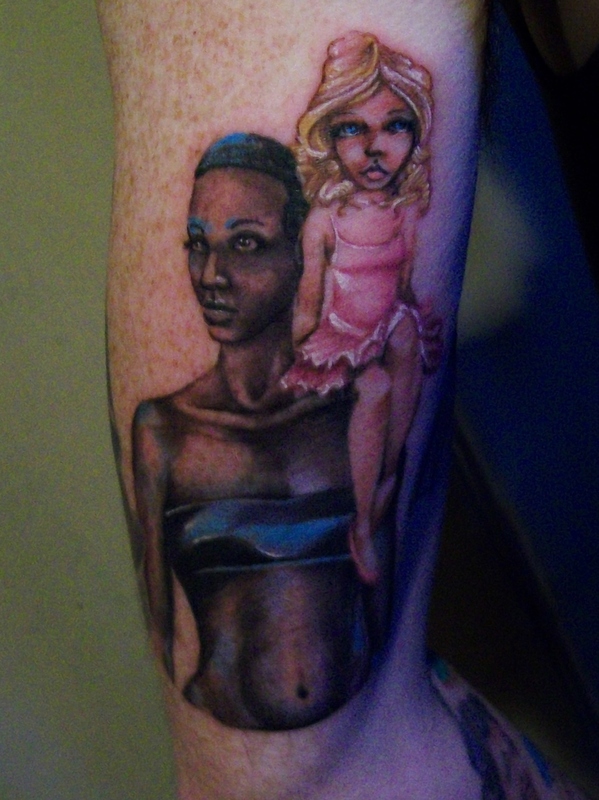 Also, the inflamed & irritated skin makes it difficult to discern what is pink ink vs tender flesh. Pro Tip: After soaking into the skin for 10 minutes, Lanacane spray reduces ALL the redness to show a true picture of the coloring. Wow. Never would have guessed that one. But it totally worked & Joe was able to see the true coloration. 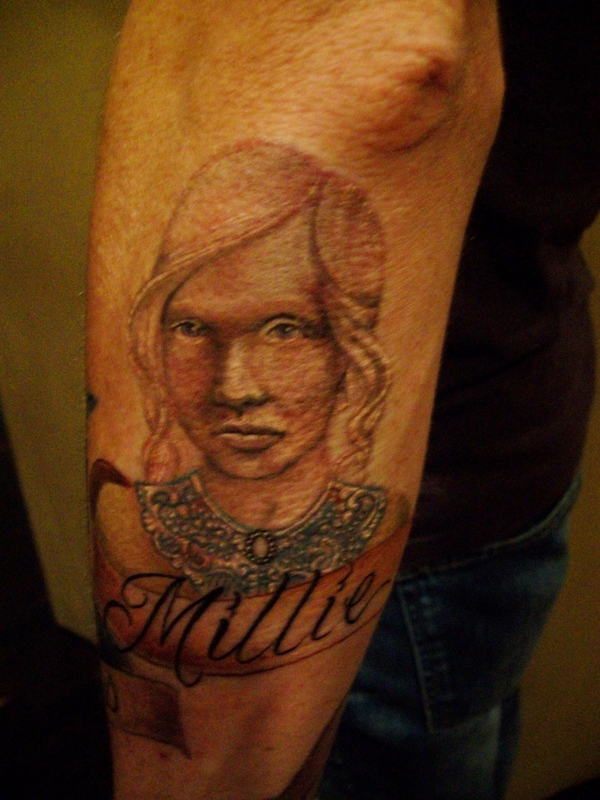 The Lanacane also numbed Millie for the last 20 minutes as he finalized her. That was weird. Like, I couldn’t even feel the needle. AT ALL. Which seems like cheating and just…odd. Through this whole process of working towards a finished sleeve, SO MANY ANALOGIES for the writing process are pinging in my head. I’m scribbling them down. So, of course, once this is all completed, I will have that juicy overarching post to sum everything up.